Why is list building such a big deal? Why am I always going on about it and writing about it? (Oh and why don’t I ever stop? Yeah… never gonna). Simply said, list building is like the lungs of your business. Your lungs pull in new oxygenated air (new subscribers) and releases deoxygenated air (your unsubscribes and “not perfect fit” people on your list). Without the lungs at their best, doing what they do, your business isn’t at it’s most productive, it’s most efficient and able to create constant warm leads for you. Ever hear the expression of throwing spaghetti at the wall and see what sticks? Yeah don’t do that with your list building. Like ever ok? As a summit project manager I’ve been privy to the coaching styles of some pretty big coaches and I’m always in shock at those that say, “just get it done (the list build) and worry about the details later” (the details being what they will do with the list, how they will sell to it etc.) Sorry but I’ve seen this style go SO BAAAADDD so many times. Including myself. Ok Story Time: My first summit was a disaster. I was brand new to the online world, and even though I had years of corporate marketing experience and event planning etc… I was a fresh noob to online. I had no clue what I wanted to do online or how I was going to sell (or geez… what I was even going to sell!) Cue the looming disaster that was my first summit. I was being coached to “just get it done, pick a topic and commit, you will figure out the details later, trust the process” Can I just call sooooo much BS on that? Worry about the details of what you will do with your new list later? What if they were the wrong list for me? What would I do then? Well I did exactly as I was coached. I picked a topic that I was vaguely interested in but had zero experience in myself, I approached over 300 potential experts with nervousness and trepidation (also a complete lack of conviction because I was LOST!) and I built out my first summit with 21 speakers, audio interview series and I launched it. TADA!!! Now let’s watch the money roll in right? SO WRONG. 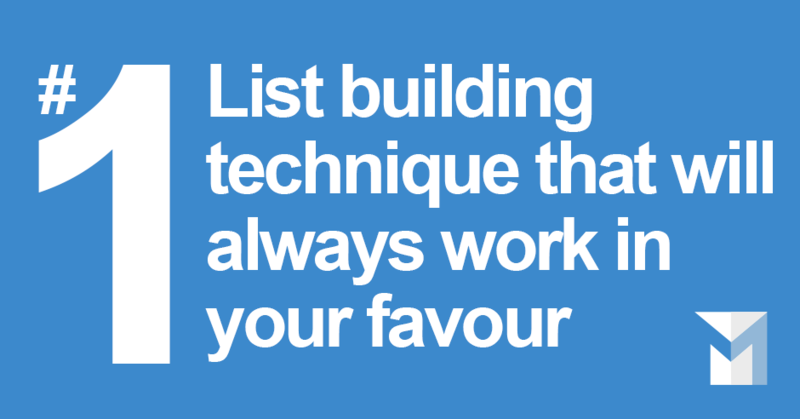 I was never able to sell to that list and eventually had to start over from scratch once I discovered that the secret to list building is to WORK BACKWARDS. Now let me qualify this with saying that a lot of coaches are awesome and I’m not attacking here. I’m saying that as the person who IMPLEMENTED this “just get it done and worry about it later” strategy dozens of times for clients and for myself, I was in the front seat seeing the train wreck that was their first attempts at selling to that list. It was sad to watch and I got pissed off at seeing it happen over and over. Hence my targeted view of list building. Here’s what I did wrong:I was not niched in. I never spent the time thinking about what I wanted to do with my bright shiny list and so the list I attracted to me had no clue what they would want from me either. WE both lost out. It sucked. I was in such a rush to get the summit done and find experts that I never thought out what those experts You have to spend the time THINKING about what you want to do with your list once you have it. Will you coach 1 on 1? You have to at least have an IDEA of what you will be doing with that list after you have it or you’re approaching this all wrong. WORK BACKWARDS with your intent on how you want to serve your list and create your list build niche from there. This will make things so much easier. I was too vague on my topics in my niche. Ever watch one of Gordon Ramsay’s shows where he comes in to save a struggling restaurant or hotel? One of the things he ALWAYS does is SIMPLIFY the menu. He cuts down the menu to just a few key dishes instead of the miriad and pages of dishes that the restaurant had. Why does he do this? Sure it’s easier for the restaurant to focus on just a small menu but he also does it because it makes that restaurant stay niched into their core message. They are a steakhouse and so they need to stay away from serving tacos, or something silly like that. But do you see we are not going to talk about the rest of the topics in the niche of dating? No we are specific to about 4 buckets here and we will those buckets with RELEVANT experts in those areas. AND NOTHING MORE. Here’s another example – Your summit is about how to use INSTAGRAM to build your business. So what are the 4 or 5 buckets we should focus on? And what do we exclude? Think about this for a second before you see my list below. Did you get some ideas? My list is who you WOULD NOT include on a summit of this topic. If your summit is building your business using instagram then you will absolutely NOT have experts on there who are Twitter experts, or that say that Snapchat is the way to go, you won’t have someone who says social media is the worst and that they only use their blog, or a podcaster who thinks Facebook is the only way to go. You gotta niche in, or it’s list build suicide. I was rushing and stop caring. I was in such a rush to find and book the required 21 experts for my list build that I started reaching out to EVERYONE I could. Hence why it took me 300 emails to potential experts to book the 21 I eventually had. (by the way 2 dropped out so I always tell my clients go for 24 experts instead of 21, that way if anyone drops out you still have the numbers). Once you’re niched in like I talk about above, then the second trick is to not rush this process of finding experts. Don’t just contact every expert you can think of. The experts you choose have to benefit and compliment your list build in such a way that you benefit and THEY DO TOO. Experts will hate you if they put in the time and effort into being on your event to get zero contacts and zero list growth as a result. By being careful and concise with your expert choosing, you are actually doing everyone a favour. Trust me, this works. I always start this off with clients with a SANDBOX excel sheet. Put down the names of everyone in your niched in topics into this list. Then we begin to weed it down to a core list by making sure they are indeed in the 4-5 buckets of subject matter like I mention above. I check to make sure they have an opt in box on their site, a business page on Facebook (with a good sized following), I look them up on LinkedIn (depending on your niche), on Instagram and other areas that fit my target audience. Each expert I am contemplating I limit myself to 15 minutes to check them out (and some will be apparent right away that they are not a good fit in like 5 seconds) and then I send each one that I’m interested in a lead generator email that is short and sweet but customized to that expert (this takes less time than it sounds, you just customize the first line of the lead gen email and then hit send lol). By spending this extra time on the pre-vetting before I contact, I’ve been able to reduce the emails I have to send to get experts from the 300 on my first summit to as low as 50 to fill a 25 person summit. That means that I booked 1 out of every 2 experts I contacted when I am targeted on my efforts vs 1 out of every 15 I contacted like in my first summit. That’s a great investment of time don’t you think? I sure do and so do those clients we work with on their summits😎. Targeted list building is the best investment for your business. This technique will save you time, money and a boatload of hassles – trust me, dumping a list is not fun, but having a non targeted list that won’t open, read or buy from you is way worse. So what now? I suggest watching this FB live I did about being niched in for a summit. If you want to know more about doing a list build, and summits in particular, I’d love to have a “no sales” chat with you. In 30 minutes I’m going to give you a clear list build strategy that works for your business. Again – no pitch unless you ask for one lol… Book that here! Also make sure you’re part of our Facebook group M Community – a strong vibrant community of entrepreneurs like you, working to get ahead online authentically. Very helpful!! I’m trying to get my list going in an authentic way and this was super helpful!! Thank you! Thanks Kellyann! So glad you found it helpful! What ways are you trying to grow your list authentically?